Your business runs on data. FormsCenter makes the capture and use of vital information easy and efficient. Eliminate the need for hand written forms and duplicate data entry. Stop managing your work through disparate, manual spreadsheets. You decide the information your business needs and use the comprehensive toolbox to design and update forms to your exact specifications. FormsCenter allows you to gather and track data in a clear, consistent and mandated way, whether you are collecting information from external sources, internal employees, or 3rd party software. Integrate all of your software and simplify data entry by easily importing and exporting information and pre-populating fields. FormsCenter works seamlessly with Medforce CommandCenter and ContentCenter to provide a complete data and process management system. To download a summary overview of FormsCenter, please click here. 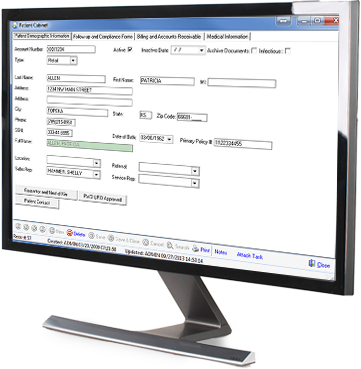 Minimize data entry effort and maximize data automation with FormsCenter. Absolute Respiratory Care is a Rhode Island-based provider committed to ensuring all patients are treated with respect and dignity and receive care for all of their needs: physical, emotional and environmental. Providing responsive customer service means quickly answering questions and proactively addressing needs of both patients and physicians. Having complete patient files that are readily accessible is a must. When the company’s veteran filer decided to retire, Medforce stepped in with its customized Filing Service to help Absolute Respiratory ensure up-to-date patient files. We are a cost driver for the organization. I judge myself by what efficiencies can I build in to reduce cost. Medforce has been invaluable in helping me achieve savings. It’s just so considerable from an administrator point of view. We can do things really quickly. There is such an ease in the way we can add things, do different things, change things. CommandCenter is an intelligent workflow that helps with our productivity and accuracy.